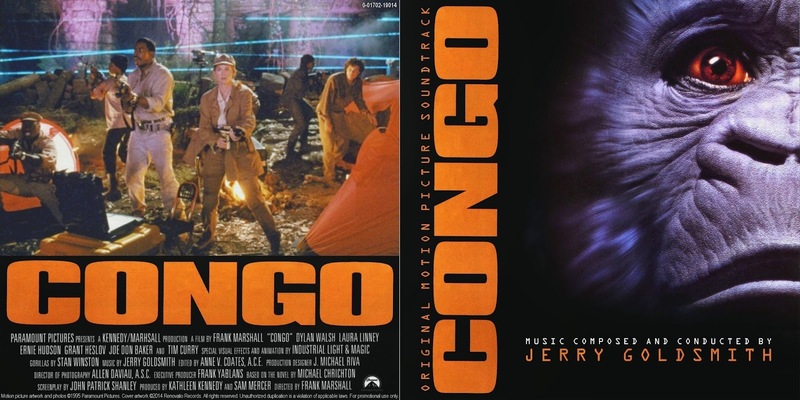 To welcome the year 2015, Renovatio Records gives you the chance to revisit some of the classic works from the nineties of the great composer Jerry Goldsmith. 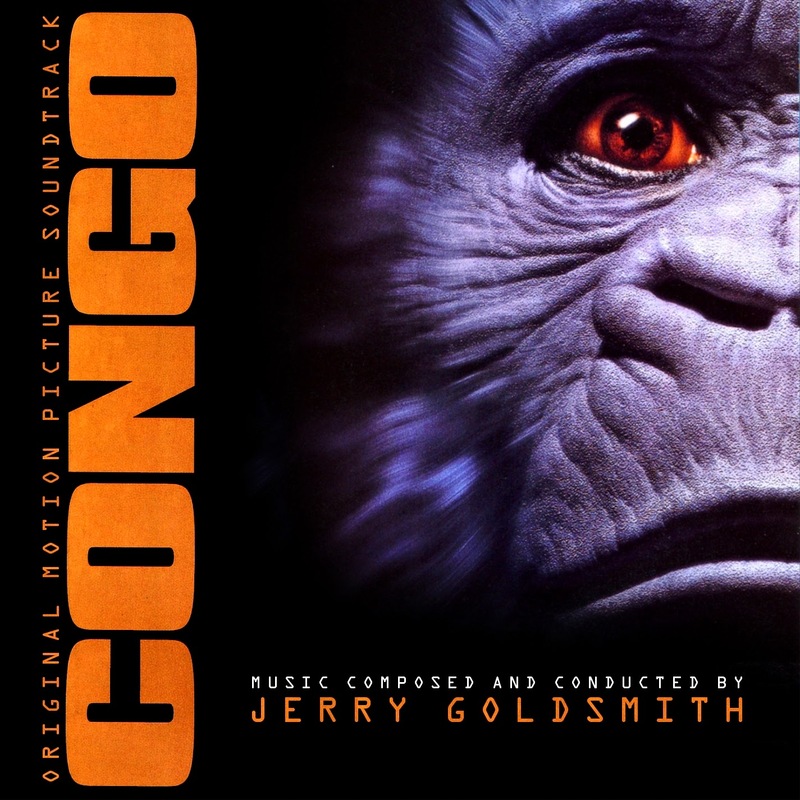 Despite being a poorly executed film that didn't earn much in terms of critical and audience appeal, the score Goldsmith composed for Congo has always been considered a highlight of the aforementioned decade. 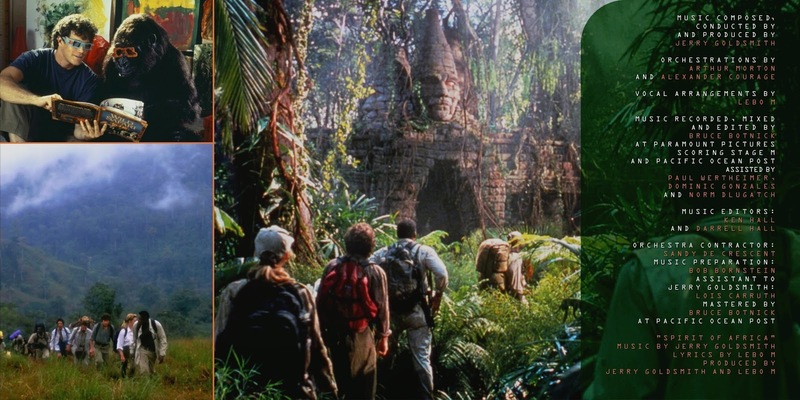 The movie, based on a novel by Jurassic Park author Michael Crichton, directed by Frank Marshall and starred by Dylan Walsh, Laura Linney, Ernie Hudson and Tim Curry, tells the story of an expedition that ventures into deep Congo in search of rare and valuable diamonds hidden in the lost city of Zinj. Guided by Amy, a gorilla that has been trained to speak in sign language, the expedition makes their way into the African rain forest and not only discover the ruins of the city but also find that the coveted riches are guarded by deadly albino apes, bred by the ancient civilization to kill anyone who dares to trespass on their lands. A regular collaborator of Crichton in past projects, Goldsmith was brought aboard the film after James Newton Howard had to step out due to scheduling conflicts. 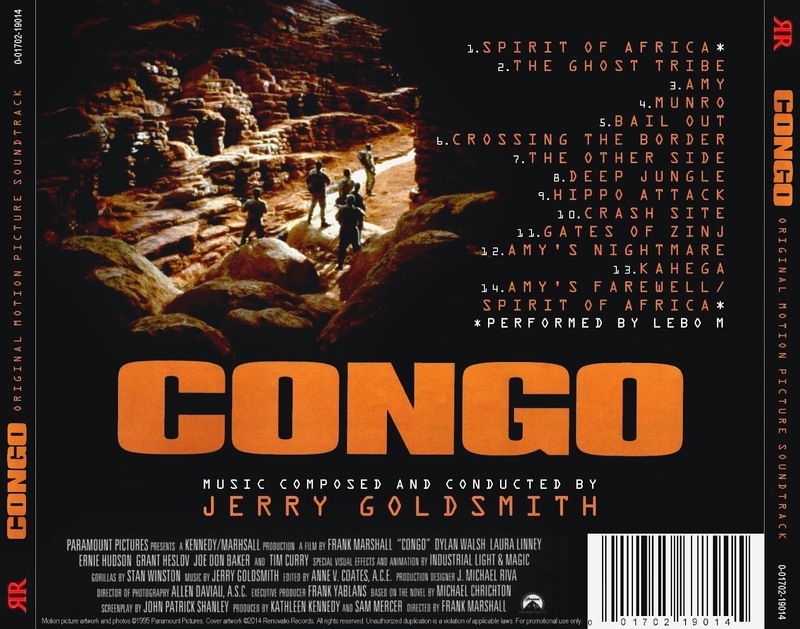 Goldsmith, as expected, provided a solid and robust action score, and also teamed up with South African composer and singer Lebo M to develop "Spirit of Africa", a memorable and gorgeous theme song that became the primary musical identity of the score, and that appears repeatedly throughout the film while we see the expedition trekking through the magnificent landscapes of Africa. 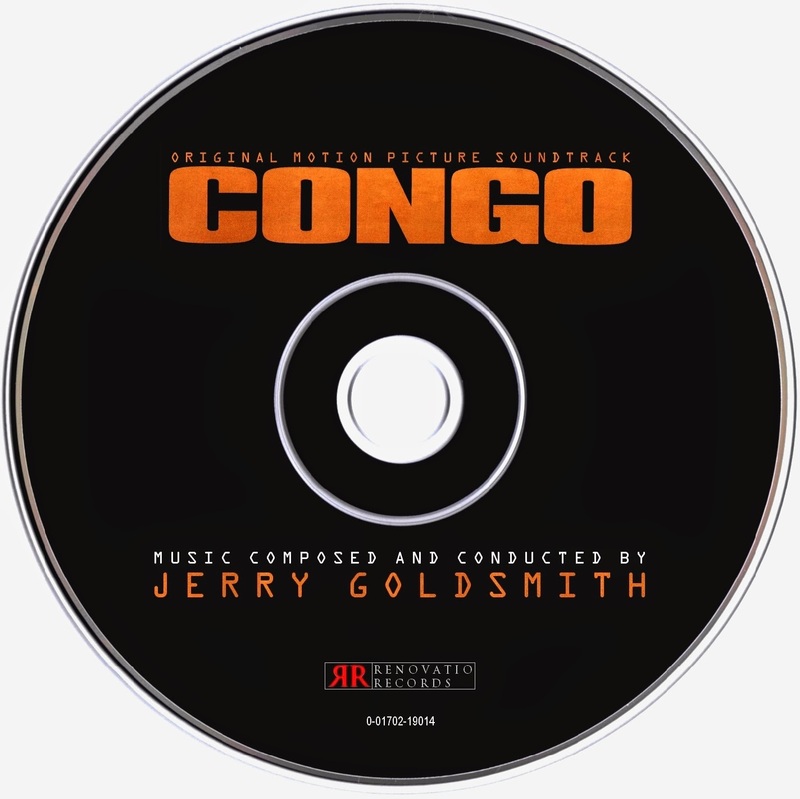 Goldsmith assembled a percussion-heavy orchestral ensemble to provide terrific passages such as those heard in tracks like "Deep Jungle", "Crash Site" and "Gates of Zinj". The composer also adds an adventurous vibe mixed with powerful rhythms as he makes his way into the climax of the film, in which he lets loose his robust action material, reminiscent of his much earlier works. The score was released by Epic Soundtrax in 1995 in the form of an extremely short album soundtrack that lacked many of the best parts of the score (mainly the action-packed track "Munro"). In 2013, Intrada Records re-issued the score in its complete form and provided all the missing highlights and much more. However, as in any complete score album, Intrada's release tends to become quite repetitive, which makes for a difficult listening experience, mainly during its middle part. Renovatio Records brings you its own arranged edition and offers you the possibility to enjoy this energetic score, which is already almost 20 years old and will always stand out as one of the most significant entries in the nineties by the maestro.